The Gulf Beaches Museum, on Pass-A-Grille Beach, can add depth to a cheap Florida beach vacation. Heck, even for us locals it provides some interesting insights to the early years on the Pinellas County barrier islands. I stopped in here on a rainy Friday afternoon about an hour prior to closing and was surprised at what I learned. As a matter of fact, I will be doing an upcoming blog entry on the Pass-A-Grille Sunset Bell that is rung each evening to celebrate the Florida sunset. 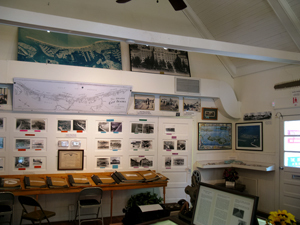 Actually, the formal name of this cool little place is the Gulf Beaches Historical Museum, which is a bit of a mouthful for locals, so you can understand why residents shorten it. It is easy to miss the museum because it is tucked into the middle on the block on 10th Avenue in the National Historic District of Pass-A-Grille at the southern most end of St Pete Beach FL. It started out as the first church on the Pinellas County barrier islands in 1917.
the building was later sold to a Joan Haley in 1959, who lived it for 30 years until willing it to the county in 1989. It was opened for public viewing in 1993. Funding to maintain the museum comes from memberships ($10 - adult/$15 - family), profits from the small gift shop and of course, individual donations. Since admission is free, this certainly helps your wallet if you have planned a cheap Florida beach vacation. * An extensive Old Florida postcard collection. * Photos from the early 1900's. * The story of Silas Dent, the Hermit of Cabbage Key. * Lots of memorabilia from Sunshine School and Gulf Beaches Elementary. * Artifacts from the Don CeSar Hotel and scrapbooks of old newspaper clippings. 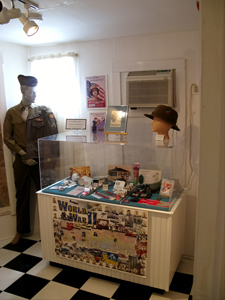 World War II was a prominent event for both original and subsequent residents of St Pete Beach FL. Many of them fought in it, especially the Pacific Theater, and gravitated to the beautiful white-sand beaches after it was over. Veterans of WW II were the driving force in the explosion of home-building on the Pinellas County barrier islands in the late 1940's and early 1950's. The exhibit features a variety of recruiting posters for both men and women. Since my mother was a nurse in the United States Army and my dad was a Seabee in the Solomon Islands, I found this isolated little room pretty interesting. It only takes about an 45 minutes to walk through the entire museum. It is a good way to familiarize yourself with some of the local history before walking over to The Hurricane for dinner and toasting the sunset. Hours: The hours and days are irregular. 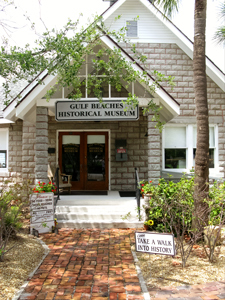 Please visit the Gulf Beaches Museum Official Web Site or call before you come. I showed up here once and found it closed because I was too stupid to checkout the hours/days. Are you looking for a cheap Florida beach vacation?